Our New Retail Shop is Open! Our new ‘factory shop’ is now open for business. Named “The Olive Market @ The Olive Press”, the shop provides a specialist retail outlet for our shareholders and pressing clients. It has long been the dream of TOP MD Bruce McCallum and on Friday 9 October it became a reality. 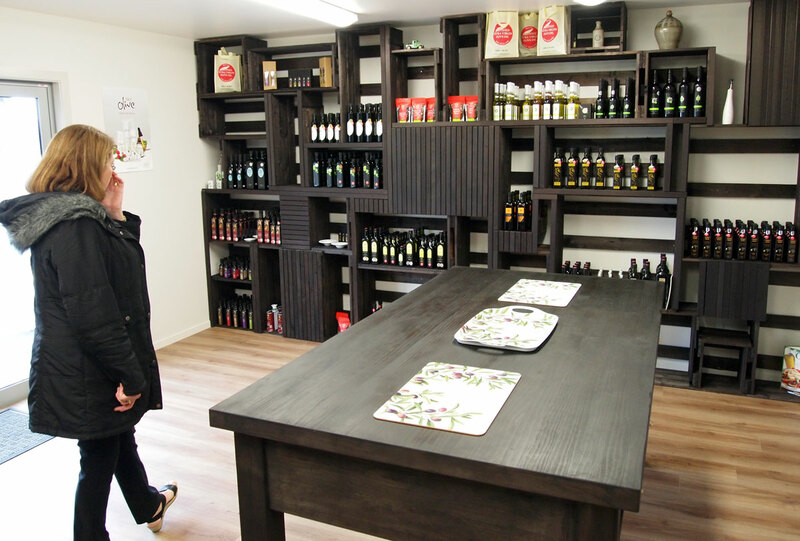 The shop stocks branded Wairarapa extra virgin olive oil, a range of infused oils from our local producers, table olives from Hawke’s Bay, olive oil body products and some stainless steel storage containers. We will be adding to the product range regularly. All olive oil for sale at The Olive Market has been pressed on the premises. A feature of the new retail store is the tasting table where free oil tastings are available. A weekly roster of two or three brands will be on display and there’s a good chance our growers will be available to discuss their products from time to time. Another Olive Market initiative is the provision of ‘fill your own’ bulk oil. Unbranded oil from some of the local groves we manage and pressed at The Olive Press will be available in 5 litre quantities – bring your own container or we have some for sale. The retail shop is part of The Olive Press complex at 14 Arbor Place, off Bidwills Cutting Road (the road to Martinborough) at the south end of Greytown. This entry was posted in News From TOP on 08/10/2015 by ponatahi.